1. Season chicken breast as desired and grill it until done. 2. Shuck and clean corn on the cob. Wrap tightly in plastic wrap and microwave 2 min. then wrap in foil and grill over high heat about 10 min, turning regularly. Once it’s got a nice charred/roasted look to it, remove and let cool. 3. Open a can of black beans and rinse thoroughly. Measure out 1/4 cup. 4. Cut corn off cob and mix 1/4 cup with beans. 5. Slice jalapeño, onion, tomato, and avocado. 6. Mix ingredients for dressing thoroughly together, and toss dressing with lettuce. 7. Arrange lettuce on a large plate. Top with onion, jalapeño, corn and black beans, cheese, and avocado. 8. 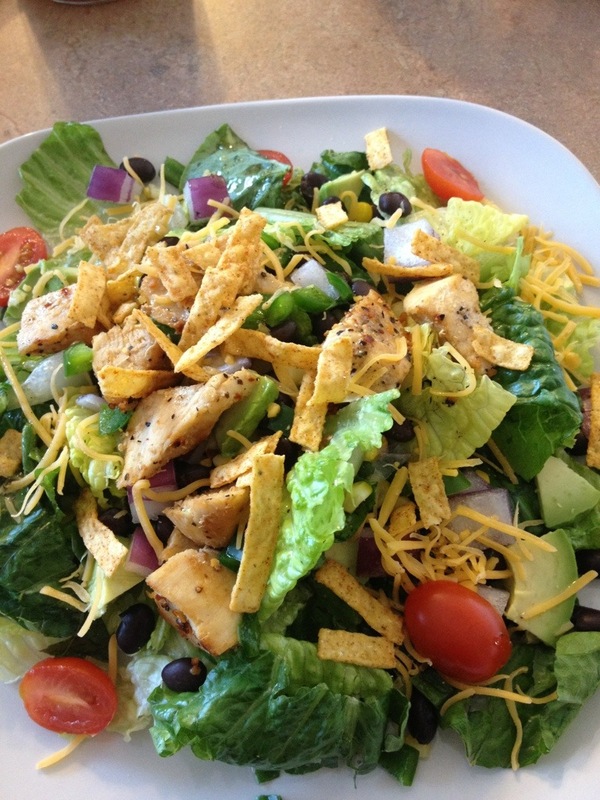 Arrange chicken and tortilla strips on top of salad.